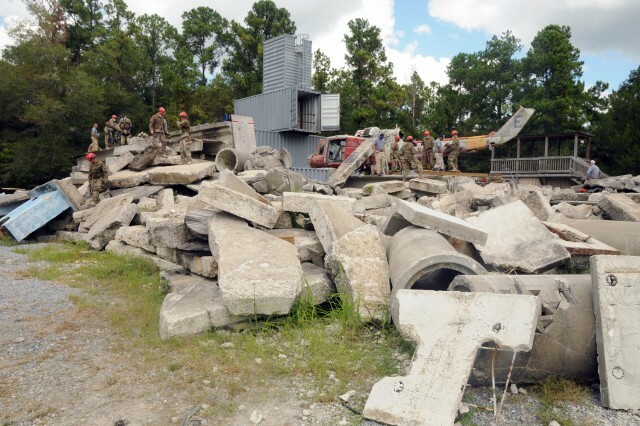 OCALA, Fla., -- A large rubble pile at the Florida State Fire College here was a testing ground for the U.S. Army Reserve (USAR) 336th Engineer Company, 412th Theater Engineer Command, based in Weirton, W.V., Oct. 6, 2018. The company of more than 50 Soldiers was required to find and rescue 14 "victims" in the massive Structural Collapse Technician Scenario. 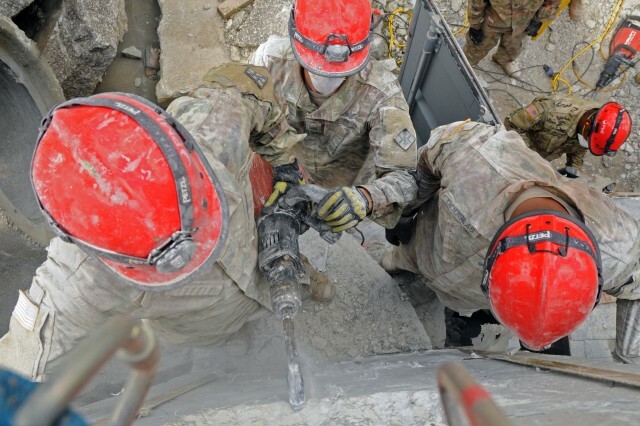 Some of the rescues found Soldiers lying on their backs in two-foot high by three-foot wide concrete spaces holding a power hammer drill weighing a little more than a gallon of paint to break through eight-inch reinforced concrete to rescue trapped "victims." Once the dust had settled, the college certified each Soldier in their hometowns in Urban Search and Rescue (USR) and Confined Space Rescue. The Soldiers also took a written exam before responding to the scenario. 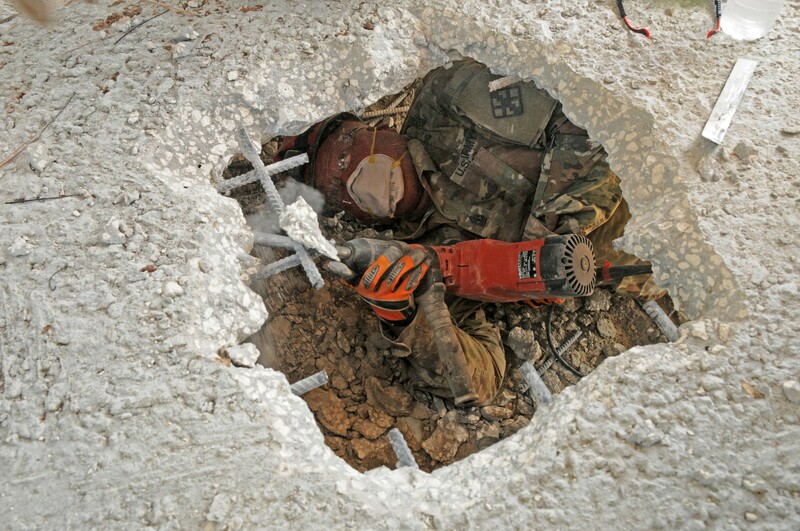 The Soldiers spent the last five weeks in USR training at the college. They trained in rope rescues, technical decontamination, vehicle machinery rescue, trench rescues and structural collapse rescues. 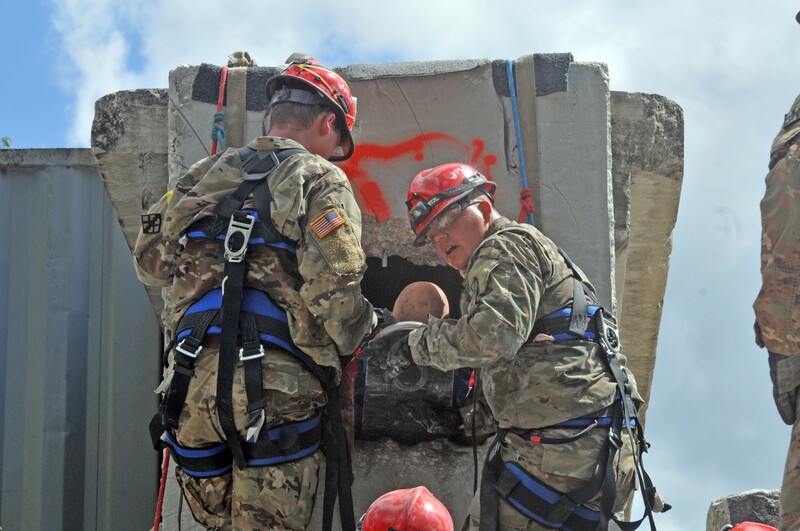 The company is training as a Urban Search and Rescue Detachment for Command and Control Chemical, Biological, Radiological and Nuclear Response Element-A (C2CRE-A). The USR training which started Aug. 26, will not end until Nov. 2, 2018. 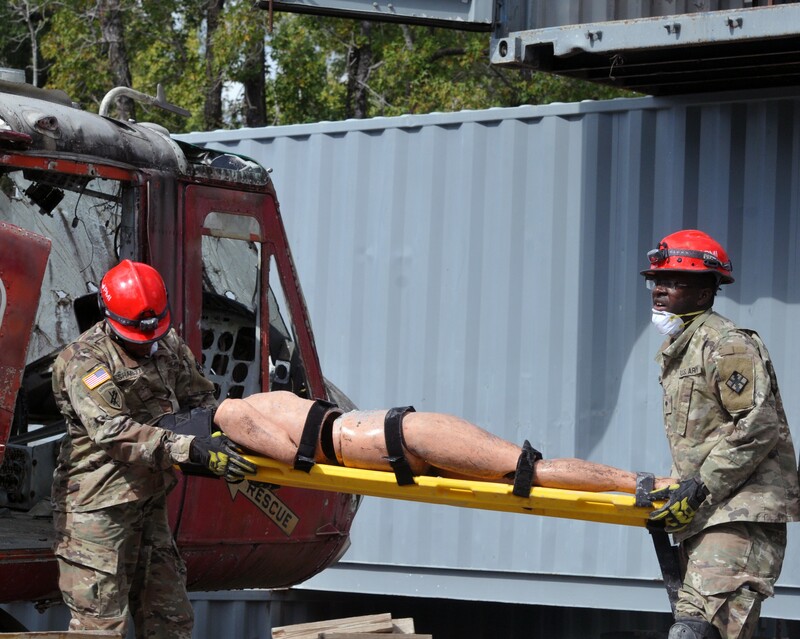 U.S. Army North (ARNORTH) will hold several external evaluations on Mass Casualty Decontamination and Chemical, Biological, Radiological and Nuclear Reconnaissance where the Soldiers will be wearing protective suits and gas masks. 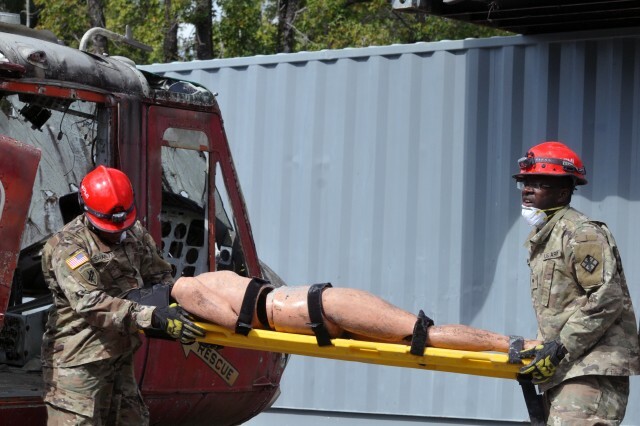 The unit will be validated after a Culminating Training Event and be among Technical Support Force (TCF) units on mission for two years to provide search and rescue. TCF units are high priority elements of C2CRE-A, and under the scrutiny of ARNORTH, U.S. Northern Command, and the Secretary of Defense. For Spc. Colton See, a civilian diesel mechanic and volunteer firefighter, this certification is going to pay dividends. "I'm going to take my training and help the people of my community and look for an emergency response team to join," said See, whose firefighting experience has dealt mostly with vehicle accidents. The scenario saw for the first time the company working together as a team. Before, it was split into two teams and rotated throughout the disciplines. Company commander Capt. Kevin Starbuck was impressed with how his Soldiers quickly adapted to working with fellow Soldiers they hadn't worked with before. "For the first time, having all hands on deck was a great thing," said Starbuck. "Everybody came together quicker and seemed to work together cohesively right off the rip. Everybody seems to be really engaged with it." One of the rescues found Spcs. Robert Douglas and Michael Thomas standing on a small ledge and using power hammer drills that weigh as much as automobile tires to break through eight-inch reinforced concrete while being bombarded with concrete dust. "I normally try and stay away from the dust," said Douglas, who looked like a bag of flour had been dropped on him. See, who also rescued a "victim" from a confined space, said not only his shoulders got tired but his elbows and forearms also got sore from holding up the hammer drill. "It gets heavy real quickly," said See with a laugh. The Soldiers also were able to rescue fellow Soldiers. Sgt. 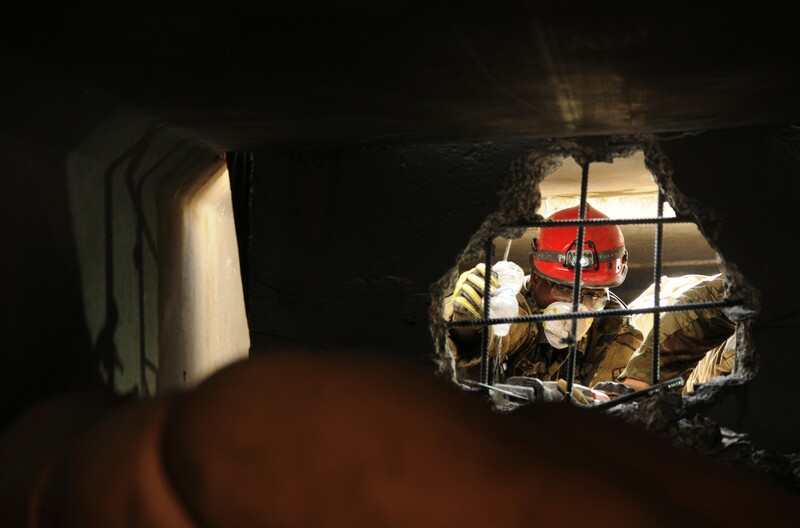 Kyle Kirkbride, a wheeled vehicle mechanic and team leader this day, who volunteered for the mission, admitted it is rewarding to pull a mannequin from a confined space but a whole different story when a fellow Soldier is "rescued." "It's much harder, it is kind of a wake-up call on how hard it would be in real life," said Kirkbride. Kirkbride, a civilian pipeline laborer, said he intends to be a firefighter once he completes this training. As Starbuck noted, this is some of the best training his Soldiers will receive while being in America's Army Reserve. 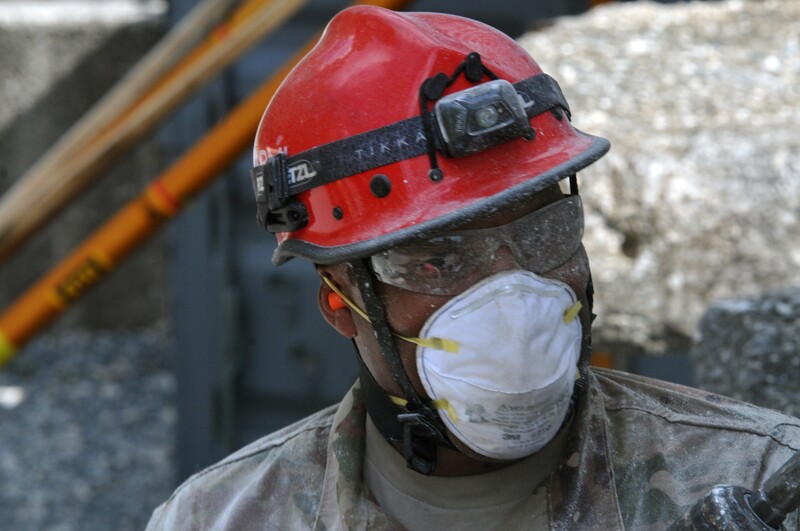 And they are not only assisting the U.S. Army Reserve in being ready for that bad day that no one wants to see but also can be there for their communities.